With PGF Caravan Services you can be sure that all your caravanning needs will always be met. We provide a variety of services to those in the Ross-on-Wye area including repairs, servicing, and motor mover supply. Our mobile breakdown team are on hand to help you no matter where your caravan has broken down. Whether you are at home or on a site, we can travel to you to help identify and repair any faults that have developed. As proud members of the Mobile Caravan Engineers Association (MCEA), one of the largest networks of caravan engineers, we are extremely confident in the services we provide. All prices that we offer are affordable and competitive, keeping you in pocket and your caravan in top working order. If you would like to contact us regarding a repair or service that you need, please get in touch with us. You can contact the team today on 01452 553 288 or fill in our online contact form. Noticing delamination within the floor of your caravan is a common problem. Delamination occurs when some of the glue which is holding the different layers of flooring together begins to wear away. This results in spongy flooring and hearing noises whilst walking over it. Caravan floors usually contain three main layers, including a top layer of plywood, a layer of Styrofoam insulation, and another layer of plywood underneath. If the glue begins to wear, then some areas of the floor will begin to feel weaker than others. There are several things that can cause delamination, with the most common reasons being exposure to water and high temperatures. If water finds its way into the flooring, then it can spread between layers and weaken the strength within them. Excessive drying of the wood can cause delamination, as high temperatures can separate the flooring. Incorrect cleaning methods may also have an impact on the longevity of the flooring of a caravan. Using too much water or failing to remove any spillages immediately can leave your floor suffering from delamination. Fixing delamination is one of the main skills that our team have, helping to keep your caravan safe and secure. If you are in need of repairs, please do not hesitate to get in touch. Once completed, you should receive a document which details what has been checked and the results from these inspections. If repair work is required, our team are on hand to help you to carry this out. As a first time caravan user it can be daunting to know what equipment you need to have with you and what you need to do. Having some helpful tips on how to prepare for hitching up and setting up once you’ve arrived at your destination can make all the difference. When hitching up your caravan to your vehicle, it is important that the gas is turned off at the cylinder, the wastewater containers are empty, and toilet cassette is empty. This prevents possible damage or accidents occurring whilst travelling. Making sure the caravan’s handbrake is on whilst on a slope helps to prevent problems from occurring, but remember to release this before moving. Another handy tip is to make sure all doors, both inside and out, are firmly shut or locked. When you are travelling the last thing you want is to find your possessions scattered all over the interior of the caravan. Lowering and locking the jockey wheel into place enables the caravan to balance itself and ensuring that the hitch is properly secured maintains yours and others safety on the road. Breakaway cables should also be attached to act as a secondary coupling in case of emergency. Uncoupling your caravan once on a sight can be a time-consuming task but is worthwhile. Make sure that the caravans handbrake is applied before disconnecting the electrical plug(s) and breakaway cable. Once you have successfully unhitched, there are a few things to complete. 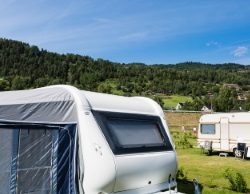 Connecting the mains power cable to the caravan and to the hook-up point is important for the supply of electricity to your caravan. Turning on the fridge, collecting fresh water, and positioning the wastewater collector are crucial steps. You should also check that you have turned the gas and the water heater on once water has been added. The small town of Ross-on-Wye has a population of 10,700 and is located on the River Wye. The picturesque Forest of Dean is nearby, providing plenty of things to do. Other places worth a visit include the Parkfield Gallery, nearby Wilton Castle, and The Thomas Blake Memorial Gardens. If you are in Ross-on-Wye and need caravan services or repairs, do not hesitate to get in touch with us. Whether you’ve broken down at home or on a site, our mobile breakdown team are available to help you. At PGF Caravan Services we are on hand to help with annual services, repairs, provide motor movers, and more. To find our more, give us a call today on 01452 553 288 or fill in our online contact form.